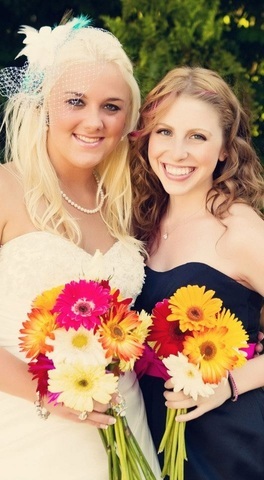 Alexandria, celebrating the marriage of her childhood friend. When you book with Rev Doug you're not just getting the most experienced minister in NWI, you're also receiving the services of an experienced wedding coordinator and a team who are dedicated to making the booking, planning, and execution of your wedding ceremony a breeze. Alexandria has been watching her family perform wedding ceremonies for the last 20+ years. Not only is she is the head of our sales and marketing team, but she is also our head wedding coordinator, and your personal guide through this process. Since your focus should be to relax and enjoy this incredibly special time, her focus is to ease the process of reserving your officiant and planning your ceremony, making it as comfortable and effortless as can be. She is happy to answer any questions you may have via phone, email, or in person during your Ceremony Planning Session, including making sense of your marriage license paperwork, and helping you find other quality wedding vendors for your big day. You can relax, because Alexandria and her team are right there with you every step of the way.